This unpretentious bistro style red is more interesting than 99% of the wines in this price range, it is a unique blend of Brachetto and Croatina varietals, making for a light to medium bodied red that is perfumed and spicy with bright acidity. The latest release is not labelled with the vintage, so you’ll need to check the back label for the lot number, which is L12014, but every vintage so far has been great for this tasty little Vino Rosso. 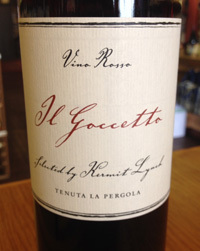 The Il Goccetto, a special cuvee done exclusively for Kermit Lynch, is Dolcetto like, but with a more aromatic floral bouquet and a groovy lavender oil and peppercorn spiciness. The nose starts with liquid roses and mixed dried flowers and sweet basil along with red berries leading to a fresh palate of cherry, plum and strawberry fruits with hints of mint, earth and candied orange rind. This fruity red is tangy dry and zippy with nice acidity perfectly suited for picnics and can be served slightly chilled. 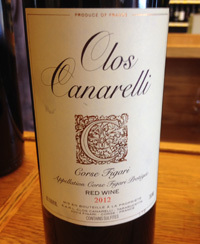 2012 Clos Canarelli, Corse Figari Rouge, Corsican Red, France. Yves Canarelli’s winery on Corsica is located near the small inland hamlet of Tarabuetta above the Gulf of Figari, with vines on a high windswept plateau. Yves is a local legend being a firm believer in the historic native varietals and the local terroir, going so far as ripping out acres of international grapes and he has adopted all organic and biodynamic practices to make the truest wine he can. These are rare and beautiful wines, with the whites being made of single varietal Vermentinu, the Corsican clone of Rolle/Vermentino and the exceptionally rare Biancu Gentile, plus an array of red field blends like this glorious 2012 Corse Figari Rouge which is comprised of 80% Niellucciu, 15% Syrah and 5% Sciaccarellu grown on loam and granite soils. This combination makes for a rich and opulent wine that is like a blend of Brunello di Montalcino and Chateauneuf-du-Pape, with Niellucciu being a clone of Sangiovese, and Sciaccarellu a clone of Mammolo a rare Tuscan grape found in Rosso di Montalcino, with the Syrah adding color and plumy Rhone like character. The 2012 Clos Canarelli Corse Figari red starts with mineral, pepper, rose petals, dried herbs and plenty of red fruits that jump from the glass, plum, raspberry, mulberry and strawberry along with anise, tobacco leaf, minty lavender, chalky stones and earthy/truffle notes. This is stunning and has glorious length and detail with smooth tannins, a full body and graceful balance throughout, drink from 2015 to 2020.
nv Solter Sekthaus, Riesling Brut, Rheingau Germany. I will always remember visiting Solter and tasting in the old cellars with the late Helmut Solter in Rudesheim, it was sad to hear of his death recently, but it was it was with good memories of the man and his wine when I got to taste the latest sparkling Riesling again. In 2009 I showed up in Rudesheim, walked across town and found the ancient cellar where Solter is and I waited, and I waited, it turned out I caught Helmut on a day where he had some stressful appointments with bankers and he was an hour and half late to meet me, but finally after I almost gave up he returned and graciously gave me an exclusive tour, in the process of drinking almost 2 and a half bottles of his own bubbly, and he told many tales of exploding bottles that ripped apart half the bottling line and when he got suckered into buying very expensive Germany oak barriques that turned out useless and horrid, and of which he stacked out front of the tasting room as a monument to a failed experiment! It was a great time, and it all still makes me smile, but the Sekt was beautiful and it still is today. 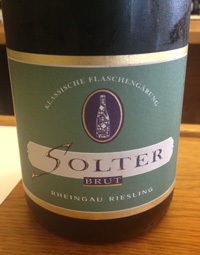 The family and tradition continues, and the Solter wines are as good as ever, especially the Brut Riesling Sekt which tastes like pure Riesling with a fine Champagne like mousse and complexity. It starts with a hint of rose petal, hazelnut, lime and earth leading to an energy filled palate of flinty spice, citrus, apple and brioche/dough with a striking light catching gold hue. This dry bubbly is Rudesheim in a flute, this is great terroir driven stuff with class and a touch of humor. Thanks and cheers to the late Helmut Solter, you are missed, but your Sekt lives on.